A few years back, Seth Rogen and Evan Goldberg released their semi-autobiographical comedy Superbad onto the world. There was much rejoicing. It was a project they began penning together when they were both 13 year olds in Canada, and years of crass, juvenile growing up were layered over surprisingly deft depictions of enduring friendship. Superbad was a rare mix of the ultra crude with a depth of character and heart, something that seemed to bridge the wonderful world of Freaks & Geeks with the stoner comedies Rogen was beginning to find himself starring in. 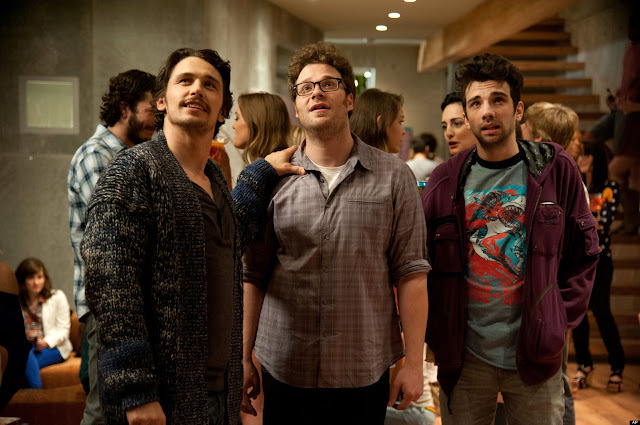 Now, Rogen and Goldberg have moved on from their adolescent alter-egos and jumped full force into the concept comedy to end all concept comedies: This is the End. We're not in high school any more, my friends. This is the End is a half-baked jumble of nonsense, an exercise in extreme self-referential postmodernism, a nightmarishly playful critique on social Hollywood, a buddy-action-stoner-horror-comedy/event blockbuster with out-of-control, violent mood swings. Mostly, though? It's funny as hell. Rogen writes, directs, and stars here as himself. We're introduced to the on-screen Seth Rogen as a guy who can't walk through the airport without someone asking him to "do the laugh" or critiquing his inability to play a different role. He seems to accept his place as cinematic comedy's lovable Fozzie Bear, and excitedly brings home his visiting friend Jay Baruchel (they co-starred on the massively underrated Undeclared) for a weekend of video games, junk food, and premium weed. The Baruchel here is a Hollywood outsider, a misanthropic guy who detests the phony put-on attitudes of Rogen's new crew and who especially hates Jonah Hill. 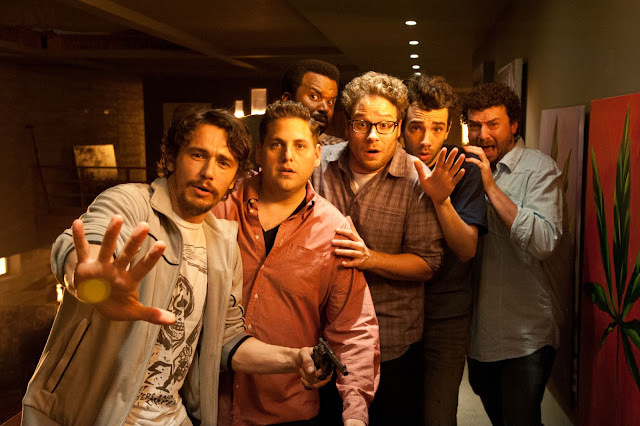 Though he protests, Seth drags Jay to James Franco's housewarming party and forces him to mingle uncomfortably with Jonah, James, Craig Robinson, and a host of familiar faces (most memorably: a coked-out Michael Cera). What begins as a mild annoyance quickly becomes a life or death matter when the majority of the party's guests are killed off when, well, all hell actually breaks loose. From then on we're treated to the survival antics of a group of narcissistic frenemies locked away in a Los Angeles fortress. Franco, Rogen, Baruchel, Hill, Robinson, and Danny McBride bicker, banter, fight, love, and constantly keep track of their resources. Things get weird quickly, and they never quite straighten back out. This is the End seems to relish being the best version of a very bad trip it can be, and the blend of real-life with the apocalyptic here leads to a quality that succeeds in being wonderfully hallucinatory. All of the edges have been smudged and blurred, and the actors are so thoroughly invested in playing to their best and worst public qualities that we love them and hate them as the film itself does. The best of the group's public perception is one the crew seems very aware of: they're the original bromance guys, the guys you're supposed to feel like you could (potentially) hang out with, and the guys who - even when they're smoking spliffs and spitting depraved lines - your mom would somehow like (or, at least, my mom does?). So, the film lets you hang out, it lets the jokes roll, the riffs happen, the circles and inward references turn in ways that bring you inside instead of pushing you out. Though the satanic horror elements begin to encroach on the fun in occasionally disturbing ways, This is the End succeeds in keeping things light. Oh, and the final scene? A weird kind of bliss. So, yeah, I haven't laughed this much in the theater since last year's surprisingly good 21 Jump Street, and I doubt I'll stop giggling about certain scenes for days to come. This is the End is evil with a dopey, smiley face; the kind of happy weirdness that can convince you the most off-color things are simply funny. Sure the plot is a stretch and the idea was likely hatched in a fog of pot smoke, but, damn if it's not so stupid it's positively brilliant.